Tana Toraja is one area in Indonesia is still thick with custom. Tana Toraja is about 350 km north of Makassar, spent eight hours using a personal vehicle mileage want any public transportation. 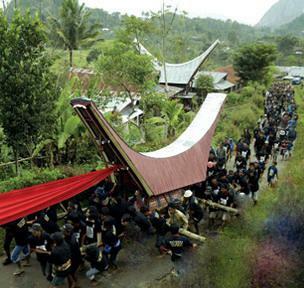 One legacy of the tradition of Tanah Toraja is Rambusolo ceremony. Rambusolo is a ceremony intended to honor the spirits of the dead and bring the world into the spiritual realm, which is returned to immortality with their ancestors in a resting place. The ceremony is often also called the consummation ceremony of death, because new people are considered dead really dead after all this ceremonial procession fulfilled. If not, then the people who died are only considered as the "sick" or "weak", so he's still treated like a living, which was laid in bed and given a dish of food and beverages, and even talk to. Therefore, local people consider this ceremony is very important, because the perfection of this ceremony will determine the position of the spirit of the deceased, whether as a haunting ghost, the ghost who reach the level of deity, or a patron god. So the ceremony Rambusolo become a "liability", resulting in any way Tana Toraja people hold it as a form of devotion to their parents who had died. Interestingly, the buffalo are slaughtered in a very unique and is a hallmark of the people of Tana Toraja, which cut the throat of a buffalo with a single blow. Types of buffalo are slaughtered buffaloes was not unusual, but the albino buffalo (tedong Bonga). The price of tens of millions to hundreds of millions of rupiah per tail.